Area High Schools have confusing yearbook picture "turn-in" requirements that most people don't understand. Call today, and let Picture It Studios help you avoid the risk of having your students yearbook photo rejected by his or her school. For over a dozen years, Picture It Studios has helped parents and students meet yearbook photo requirements and has never submitted a late photo or had one rejected; all the while creating beautiful, personalized photos of future graduates. The High School Senior year is an important milestone in the life of your child. At your direction we will work very hard to capture and memorialize﻿ important aspects of your child's life. Click here to schedule your H.S. Senior Session! Each H. S. Senior's picture selected for print is professionally (retouched) edited by our staff of graphically trained experts, who employ the world's most powerful digital photo editing software to make sure that your child looks their very best. The Southland's is surrounded by several High Schools, including Eagle Crest, Grandview and Cherokee Trail on which we focus. 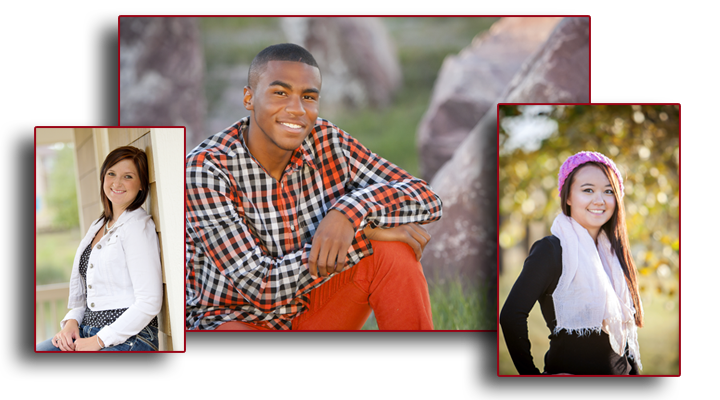 Over the years we have been privlidged to photograph students from dozens of Denver Metro Area High Schools. *Wall Portraits come with a backing to ensure it stands the test of time. *$50 pre-payment required at time of Southshore or beyond﻿ booking.